A potential Rays balk in Seattle was averted when Jerry Layne called "time" as Tampa Bay pitcher Drew Smyly stopped his pitching motion, resulting in a balk-turned-no balk call at Safeco Field. HP Umpire Jerry Layne convenes his crew. With two out and a runner on third base, Rays catcher Curt Casali requested "time" as pitcher Smyly began his pitching motion, from Windup Position, to Mariners batter Dae-Ho Lee. Replays indicate that as HP Umpire Layne acknowledged the "Time" request, Smyly stopped his motion, prompting Layne to call Smyly for a balk and award Mariners baserunner R3 Nelson Cruz home plate. After an argument from Rays Manager Kevin Cash and consultation with crewmates, Crew Chief Layne reversed the balk call and sent Cruz back to third base, ruling that he had erroneously called "Time" prior to Smyly's start-stop balk. 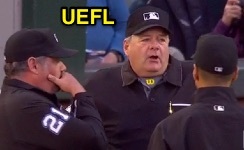 Question into the UEFL: "What in the world just happened at the Mariner's game in the 1st inning?" A: Official Baseball Rule 5.12(b) concerns Calling "Time" and Dead Balls, and states that, "The ball becomes dead when an umpire calls 'Time.'" However, the rule also states, "Except in the cases stated in paragraphs (2) and (3)(A) (which concern light failure and an accident which incapacitates a player or umpire) of this rule, no umpire shall call “Time” while a play is in progress." In other words, although it was possible and likely probable that Smyly actually did balk by stopping his delivery in response to catcher Casali—and not umpire Layne—'s request for time out, Layne killed the play prior to the potential balk, meaning that the potential balk violation was washed out. Had Layne not granted Casali's request for time and Smyly's start-stop action remained the same, then the balk would likely have been enforced. Realizing his error in calling "Time" while a play was in progress—Smyly had started his delivery, which constitutes a play in progress—Layne reset the play by returning R3 to third, explaining the umpire's version of an inadvertent whistle to Mariners Manager Scott Servais, who put up a brief but fortuitously understanding argument.